It’s not always easy getting kids to play alone, they do love our company! But give it a try, one step at a time. At first, try to just sit beside your little one silently, while he plays. Let him explore the play materials freely. Once he is absorbed in the activity, try moving to another part of the room. Your toddler will still feel comfortable with you nearby. When he is happily playing on his own, try not to hover, but make sure his play area is safe and comfortable. When we tell children exactly how to play with a toy, or what to do with it, we limit their exploration and imagination. A study from the Massachusetts Institute of Technology found that children were more likely to figure out a toy’s extra characteristics (like a surprise noise it makes) when left alone with it, than if an adult first showed them how to use it. You have to be aware of how often you interfere and instruct your child when he is playing. A study from the University of Missouri found that children become less engaged when their mothers tell them how to play and what to play. Children were even found to have negative feelings towards their directive mothers, especially when their directiveness was negative or critical, with a lack of affection. It’s important to show affection towards your children while supporting their play and, at the same time, be careful not to dictate exactly how they should do it. That way, you’ll benefit their development. Let your little one play without direction for a while, and you’ll see his creativity flourish before you. My little one is 8 m/o, i was just wondering what kind of toys would be best to get him exploring. I would like to have a few stimulating toys/objects that i can rotate so he does not get bored. Any recommendations would be much appreciated . Thanks for reaching out! 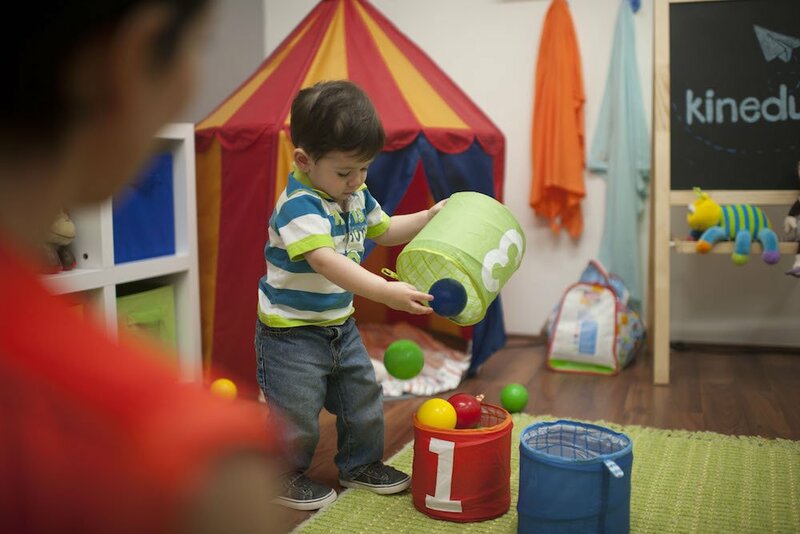 At 8 months, babies are all about exploring their surroundings and refining their fine motor skills. Great toys at this age are large blocks to stack together, pull and push toys, and things to play pretend with like dolls, puppets, and toy cars. Take a look at our article on age appropriate toys for more insights! Thanks for reaching out. If you’re looking for age-appropriate ideas for playtime with your daughter, I suggest you download our app. Go to http://www.kinedu.com and give it a try! You’ll find tons of great ideas for quality time with your little one. To encourage your little one to play by herself, at first, try to just sit beside her silently, while she plays. Once she is absorbed in the activity, try moving to another part of the room for a while. Your toddler will still feel comfortable with you nearby. A toddler’s social and emotional development is constantly evolving, you’ll notice lots of changes. Take a look at this article from the American Academy of Pediatrics. It’s very interesting and could give you insights on her emotional development.